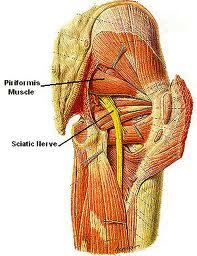 Sciatica symptoms/causes and the Sciatic Nerve. Sciatica is the common name for any condition that disrupts function through the sciatic nerve. This can occur via Neuralgia, which is the compression or tethering of a nerve as it passes between other tissues, or via Neuritis, which is the inflammation of a nerve. With Sciatica neuralgia is the most common cause. When Sciatica is used as a lay term it means pain down the back of the leg but this does not identify the origin of the pain. True sciatica caused by compression (Neuralgia) or inflammation (Neuritis) can occur for several reasons such as disc herniation, vertebral osteophytes or by compression by the Piriformis muscles which is called Piriformis Syndrome. It is this more precise definition that your medical professional (Doctor, Physiotherapist or Osteopath) will assess you for and diagnose you with. Do not delay your visit to one of these people. Symptoms can vary a lot due to the fact that this large nerve serves much of the posterior leg. Some common ones apart from pain are, numbness or altered sensation in the lower leg/foot, swelling in the sole of foot and toes, loss of power such as when trying to stand on tiptoes on the affected leg or in some cases muscle wasting. The Sciatic nerve is the strongest and longest of the the peripheral nerves. 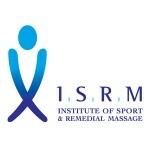 It provides the motor supply to the Hamstrings (the muscles at the back of the upper leg), the muscles of the lower leg and foot (so allowing us to make the muscles work) AND it provides the Sensory supply to the whole back of the leg (so allowing us to feel what is happening at the back of the leg). The Sciatic nerve is formed by what is called a plexus where several nerve roots which exit from different vertebra come together at the plexus to form the nerve. This also occurs in the neck (Cervical Plexus) and for the arm (Brachial Plexus). The Sciatic plexus is formed from nerves L4 (Exiting between Lumbar vertebra 4 and 5 in the lower back) to S1 (Between Sacral vertebra 1 and 2). The Sciatic nerve is comprised of two independent nerves (the Tibial and Peroneal nerves) which travel together as the Sciatic nerve until they part just before the back of the knee at the bottom of the thigh. However in about 10% of the population these two nerves are distinct down the leg parting company higher up. The Tibial and Peroneal nerves serve different muscles and parts of the lower leg and so can be used by your physician to determine which of the two nerves (or both) are being affected. They will also be able to tell roughly where down the leg the problem lies. Scaitica can be caused by degenerative disc disease, a protrusion or herniation, of the discs between L4/L5 and L5/S1 which then compress the sciatic nerve in a neuralgia. Diagnosis of this will usually require a scan of some kind by your doctor such as an X-ray or MRI. Osteophytes, or bone spurs, can grow in response to weakened joints to help support them and if that happens from the L4 level down to S1 then they can also compress the sciatic nerve producing sciatica. This too would require a scan such as an MRI for accurate diagnosis by your doctor. The Sciatic nerve exits the sacrum in front of the Sacroilliac joint and this can be a common cause of sciatic neuralgia. 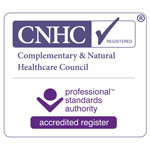 Due to the depth of this location it is impossible to treat with massage and would require a scan to accurately determine. 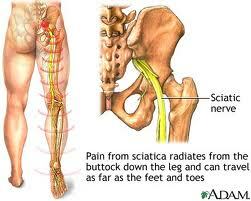 Symptoms due to true Sciatica can be felt anywhere down the back of the leg down to the feet and toes even. It can also be caused as mentioned above by entrapment due to the Piriformis muscle called Piriformis syndrome. The Piriformis is a small muscle that is deep to the Gluteals and helps to stabilise the hip during walking or running. The problem arrises because the Sciatic nerve which is about 1 cm thick at this point passes either very close to the Piriformis or, in roughly 20% of the population, through the muscle itself! Obviously if the nerve passes through the muscle then it can easily become entrapped but even passing close to it can cause problems if we overuse the muscle through exercise or repeated lifting etc. The Piriformis can also become overworked from postural problems such as hyperpronation (where the medial arch of your foot rolls in/collapses too much during the weight bearing phase of walking). If the hip joint becomes inflammed due to arthritis or after a hip replacement for instance this too can lead to the Piriformis compressing the Sciatic nerve due to the reduction is space available for the nerve to travel through. Pirformis syndrome will usually be diagnosed by your physician with a combination of your history to determine what you have been doing and moving your leg in a way that will cause the Piriformis to compress the Sciatic nerve and reproduce your symptoms. Symptoms due to Piriformis syndrome will usually be deep in the buttock or perhaps into the top (proximal) part of the posterior thigh. They are usually more local and contained than the symptoms from true Sciatica. The Sciatic nerve can also be compressed by your Gluteals (the largest bottom muscles) and by two small deep bottom muscles called the Quadratus Femoris and the Obturator Internus. The last two act with the Piriformis to help stabilise the hip during the stance phase of walking/running. 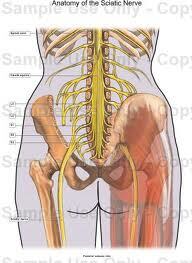 The last commonplace for entrapment of the Sciatic nerve is between the Hamstring muscles at the back of the thigh. This again can usually be determined as the cause of the problem by specific testing of leg movements involving the hamstrings which should reproduce your symptoms. Due to the fact that the Peroneal division of the Sciatic nerve travels on the outside and the Tibial division on the inside symptoms will often involve this nerve first. There maybe numbness on the outside of the lower leg (sensation) and/or loss of power in moving the foot out (called foot eversion) or in loss of power in picking the toes up when walking producing a foot slapping sound. However there are many differential possibilities of sensation and motor loss leading from Sciatic nerve entrapment which should always be seen by and diagnosed by your doctor (or other qualified medical person such as a Physiotherapist or Osteopath etc) as soon as possible. Do not to delay this process so that the possibility of lasting damage to the nerve is avoided.